Barska has redesigned their popular Sniper Scopes series of rifle scopes. In addition they also added models to expand their current selection to include four models. The improvements on this updated generation include improved optics, as well as improved exterior design and structural integrity. It’s important for Barska to keep this series of rifle scopes up-to-date as it is their best selling range of rifle scopes. When Barska went to redesign their Sniper Scope series they listened to customer reviews and suggestions. This lead to added features and improvements on this next generation of Barska Sniper Scopes. Historically, these rifle scopes have been commonly used on AR tactical rifles and on long range bolt action rifles. Barska incorporated military standard specifications and combined them with state-of-the-art sighting features. The result is a new range of scopes that are a truly great choice for your rifle. In addition to all the features mentioned, Barska also offers a limited lifetime warranty on their range of Barska Sniper Scopes. Barska added a new mil-dot reticle to the tactical sniper scopes. They are green and red illuminating mil-dot reticles. When the illuminiation is switched off then the retricle is a standard black reticle. When illumination is switched on then you will have the choice of green or red illumination including five different brightness settings. The different colors are available to allow for better precision targeting. When the reticle is switched to green lighting, then it allows for easy targeting of dark targets during the day. Green lighting has the advantage that it is extremely visible to the human eye and is high contrasting. The red light is important to have when you shoot in dark conditions. When your eyes adapt to the low light conditions then the red light will not interfere with your natural night vision. 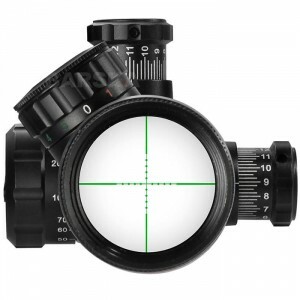 The Mil-Dot style reticle allows for range estimation using the built-in mil-dot graph. The rheostat, the knob to adjust the brightness, is set at a 45 degree angle. This allows quick and unobstructed viewing of the knob to adjust the elevation. This full-featured, compact 3-9x42mm Model is designed for short barreled AR type rifles like an AR-15 or M4 rifle. It’s also quite popular on AR style 22’s. It featured exterior windage and elevation adjustments which are lockable. This mid-range rifle scope is perfect for your bolt action or AR rifle. For increased and improved light capturing it features a 30mm tube and a 50mm objective lens. This makes it an ideal scope for low light conditions. 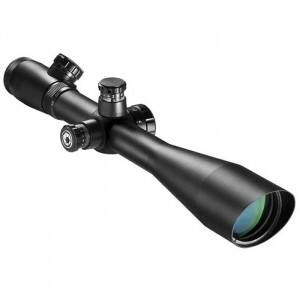 This rifle scope is popular with hunters and target shooters as an all-purpose riflescope. This rifle scope is designed to be a mid to long range rifle scope. It is side parallax adjustable to support long range shots. The focus distance can quickly be fine tuned when you increase the magnification. This riflescope allows for bright images at high magnifications due to its 30 mm tube and 50 mm objective lens which allow to capture increased levels of light. This sniper scope model is a completely new model for long range shooting. It will allow shooters to push their shooting skills to the next level. The shooter can fine tune the focus distance with the side parallax adjustments when the magnification gets increased. This model also has a 30 mm tube and a 50 mm objective lens to allow for bright images when selecting high magnifications. Barska offers an impressive new line-up of the well-known Sniper Scope Models. They are a true improvement over the older models and definitely worth a look. Check out our Barska Riflescope Reviews to learn more about these and other remarkable rifle scopes from Barska.